This chapter examines Eugene Ionesco’s The Killer (1957) in the context of the twentieth-century interpretation of imagination as both an intentional mode of consciousness and defined by an essential nothingness. The Killer is a play which places the multiple modes of perception and imagination of the spectator center stage. 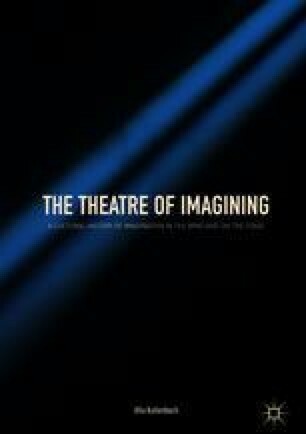 Kallenbach explores how the play’s features of, for instance, invisible spaces, offstage soundscapes, grotesque objects and metamorphosing characters continually demand that the spectator renegotiate that which is perceived and imagined on- and offstage. Kallenbach’s study provides an interpretation of how this scenic dramaturgy of the play, with its intricate interplay of presence and absence, engages and guides the spectator to continuously shift between several—and sometimes overlapping or even conflicting—modes of perceiving and imagining.